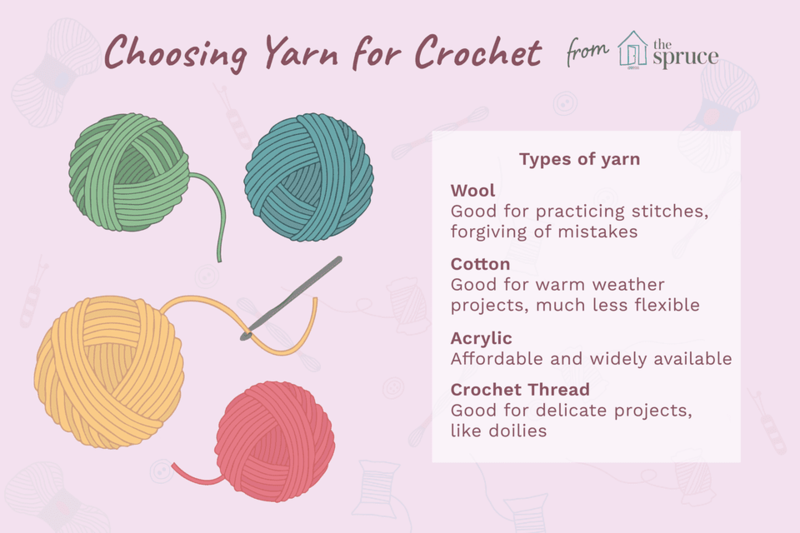 These yarn recommendations are intended to help beginning crocheters select their first yarn to use for making practice swatches when learning how to crochet. You can crochet with just about any kind of yarn and even non-fiber yarn-like alternative materials. However, as a beginner, there are some yarn options that are going to be easier than others to work with, and you'll find it best to begin with these choices. The first decision that you have to make is what type of fiber you are going to work with. There are many, many different options for both animal fibers and plant fibers. You can crochet with everything from baby alpaca yarn to banana silk yarn. However, the three most common yarn choices for beginners are wool, cotton and acrylic yarn. There are pros and cons to each, although any will be suitable for beginner crocheters. Cotton yarn: Cotton is an inelastic fiber, which makes it slightly more of a challenge to crochet with than wool is. (That same quality makes it a great choice for specific types of projects, though, where you want the item to hold its shape!) Although some people find cotton slightly more challenging than wool, it's not all that different, and it is certainly something you can try as a beginner. If you're learning to crochet during the summer when the heat makes it unpleasant to work with wool, cotton yarn is an especially great choice because it is lighter than wool. Acrylic yarn: Overall, acrylic is a popular fiber with crochet enthusiasts; acrylic is widely available, it comes in a variety of colors, and it is usually one of the more affordable choices for yarn. Acrylic yarn is a more-than-acceptable choice for beginners. The one key thing to be aware of is that some of the cheapest acrylics can be challenging to crochet with because they may split apart. This isn't common but it does happen, so if you start to crochet with acrylic and are having a tough time, try switching to a different brand of acrylic yarn or to cotton or wool yarn instead. Don't make it hard on yourself to learn to crochet. You may be wondering how you will know what kind of fiber you're working with. As you get used to working with different yarn types, you'll often be able to tell just by looking at or handling the yarn. However, before that becomes second nature, you can easily find the type of fiber listed on the yarn label. In fact, learning how to read a yarn label will provide all of the information you need to know when choosing the best yarn for crochet. The fiber types that we have been discussing thus far refer primarily to yarn, as opposed to crochet thread. Thread tends to come in cotton or acrylic, though, so the information above covers the basics. Most people find that yarn, which is thicker than thread (see more sizing information below), is easier to work with than crochet thread. That said, there are certainly crocheters who've jumped right into working with crochet thread from the beginning. People who wish to make lightweight, lacy items such as vintage-inspired doilies and tablecloths may want to start right in with crochet thread. However, if you don't have a strong preference, start with yarn and work your way towards threads. As aforementioned, yarn is thicker than crochet thread. And there are different thicknesses of yarn as well. Thickness is called weight. You can find the weight of the yarn on its label, where it will be numbered 1-7 (from the thinnest, which is like a thick crochet thread, to the thickest). As a beginner, it will be easiest to work with a worsted weight yarn, which is labeled #4 on the yarn label. This is a good medium-weight yarn. A "3" (DK weight) is also acceptable but might be too thin for some newbies. And a "5" (bulky weight) works well, too, but again may not be as easy as the worsted weight yarn. Everyone has their preferences, though, so don't be afraid to try different options. Note: You should use the correct size of crochet hook recommended for the yarn weight that you are using. Most modern yarn labels will specify this size on the label. The Craft Yarn Council offers a standard guide to yarn weights and hook sizes. Yarn price: The price of yarn can vary significantly from fiber to fiber and brand to brand. As a beginner, you may find it smart to select among the most affordable yarns so that you get the hang of the craft before investing a lot of money. That's why cotton, wool, and acrylic are top fiber choices; they tend to be the most affordable. Yarn yardage: Every ball of yarn comes in different yardage amounts. This relates again to the price. You may find two balls of worsted weight wool yarn that are the same price; look at the yardage to make sure that they have approximately the same amount of yarn in each ball. Yarn color dye lot: If you are going to be crocheting a large project that requires more than one ball of yarn then you probably want to make sure that the colors all match (assuming that you are using the same color or colorway for the whole project). This is when you need to look at "dye lot" on the label; make sure that the balls you get all come from the same dye lot number so that they don't have significant differences between them. Washing details: Different fiber types may require different washing instructions, which will be important if you are hoping to crochet something to wear. For example, you can use superwash wool that is safe to put in the washer and dryer or you can use a type of wool that will shrink in the dryer and must be hand washed and dried flat. Your yarn label should provide this information. Ethics and yarn. There is a lot to be learned about sustainable yarn choices, organic yarn, vegan yarn, and other yarn decisions that may relate to your personal ethics around animals and the environment. If this is something that concerns you, there is a lot of information available to aid in your selections. The most important thing to know is that you can crochet with any type of yarn so don't stress out too much about choosing "the perfect yarn" for your beginner projects. Have fun with it all.